Description: Demonstrates the optics of a raindrop and the concentration of light at particular angles. Put the glass bowl on the jack in the middle of the center table. 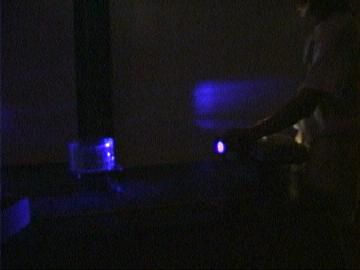 Put the slide projector on another scissor jack and aim to illuminate the audience side edge of the bowl. It works best to cheat and illuminate only the glass and not much of the water. 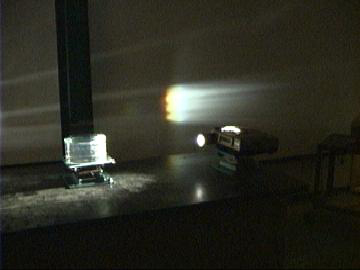 The refracted image should be visible on the projection screen. You may wish to rotate the bowl to find the smoothest section of glass so that the image is not too distorted. Fill the flask with cold water, trying not to let in too many bubbles. Mount the flask in the finger clamp stand and set aside. 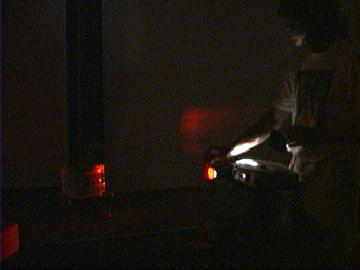 Start with a red filter over the projector and point out a concentration of light at the maximum refraction angle. Mark that leading edge with a sticker on the screen ("sign here" sticker works well). Switch to a blue filter and notice the change in maximum angle. Switch to white light to see the full rainbow. Move the projector to point at the flask. Observe the 360 degree rainbow. Note: Very hard to setup, and not effective. We recommend against using this one.